I showed up early to get a bird’s eye view of the jury experience from a rare perspective: the juror’s. New York County jurors are summoned from Manhattan, Roosevelt Island, and one zip code in the Bronx. At nine a.m. sharp, the senior jury clerk opened the metal door and let in roughly 200 freshly minted prospective jurors, including me. On a frigid day, it was no surprise to hear a fair amount of coughing, so navigating to a disease-free seat was like skiing a slalom run. In addition to the jury summons, the courts now request another form asking anonymously for one’s demographics (gender, age, ethnicity) to help the court gauge who is showing up. The information is not available to the public – I asked. Some improvements (summoning jurors for only two to three days rather than three minimum; summoning jurors less frequently – only once each six years) have been implemented. Other “improvements” to the jury experience – such as providing work space, computers, lots of charging stations, etc. are, sadly, good on paper but a myth, not reality. Of the approximately 10 desk spaces available in a side room, several were broken and the power strips filled up quickly or didn’t work at all. Of those that worked, oddly, my phone, like me, regained power only weakly after quite some time. There are four potential reporting areas for New York County jurors. Here, at 111 Centre Street – Room 1121, it is possible to be sent to the same or other buildings for voir dire and/or to serve if chosen. Oddly, while many courthouses have a cafeteria, or at least some sort of hallway refreshment service, the one thing that almost all prospective jurors need, coffee, is nowhere to be found in the building. One must walk – within the 15 minutes typically allotted for a step-out break – two or three blocks to the closest Starbucks or Dunkin’ Donuts and hope that there isn’t too long a line there or at building security upon returning. Lunch is typically from one to two p.m. On a slow day, the merciful clerk cut the group loose at 12:30 to return at 2:15 p.m. The clerks did an excellent job pre-screening jurors, explaining all the reasons that duty could be postponed. They were clear that the commitment would not permit any conference calls for work or meeting any other outside obligations during the hours of nine to five. Anyone with doubts was told to reschedule. People were allowed to keep their cell phones on vibrate, but only to take calls in the hallway. Once one heads to a courtroom for voir dire, phones must be shut off completely (but, at least, unlike in federal courts, one can keep them handy). As a result, the entire area was like Amtrak’s quiet car on the Acela. Do you know what a really quiet, uneventful situation does to people? Yep, you guessed it – it puts them to sleep. It was a slow day for jury trials (the first day back from Christmas and New Year’s). Only two small panels (about 20 each) were called for voir dire, leaving the bulk remaining to burn time in the jury duty waiting area. Over time, it looked like an airport lounge after many flights have been cancelled, with prospective jurors deteriorating in composure, from alert and coiffed, to taking off their shoes, dropping formalities and falling asleep in progressively awkward horizontal positions of repose. For me, the day was more fieldwork and fascinating than one with potential to serve as a juror. No lawyer, seeing that I am a jury consultant or learning of my experience working with law enforcement or in litigation, has ever put me on a jury since I joined the profession. My snacks and amusements ran out before the day was done, so despite my fascination with the inside-out experience, after a few hours I too was rendered a slouching, snoring mutt just like everyone else. I have always had empathy for jurors and have advised lawyers to understand the limits of jurors’ attention spans. Sitting alongside jurors today was a great lesson: the reality is worse than I thought. So, if you as a litigator do get a juror to pass go and serve on your jury, your hurdle just got higher. They may have been in a stupor for hours or days, just waiting, before getting to your courtroom, so you are starting from behind at getting them to be alert and care. 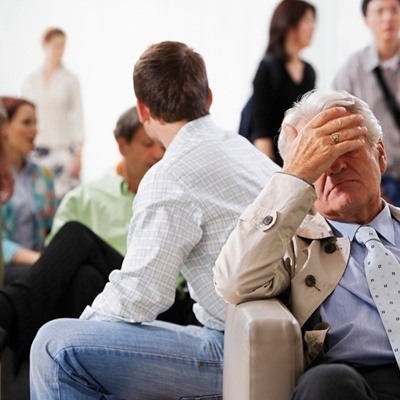 The “general anesthesia” of waiting in the jury area must wear off before they can actually pay attention. And in New York County, it’s an unimaginable horror: they may not even have coffee nearby to help. Who Are The Highest-Rated Jury Consultants?